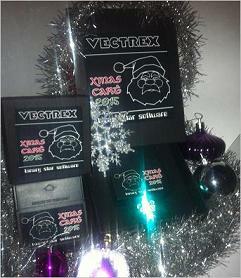 Tuesday 8th December - Time to get festive on the Vectrex! Binary Star Software has just made a Vectrex cartridge release for the close of this year! Called XMAS Cart 2015, this game cartridge contains two games. One game is called Parcel Panic. Here you play as one of Santa Claus’ helpers, using your grabbing arm to pick presents off the assembly line conveyor belts. However, Santa Claus doesn’t tolerate mistakes so be careful! The other game is called Space Tree X. This is rather like a Christmas version of Asteroids. Instead of asteroids, parcels are floating in space, and you shoot at them with your ship which just happens to be a Christmas tree. For information on how to order visit Binary Star Software’s website. 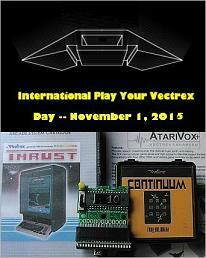 Sunday 15th November - VEC9: Vectrex console’s big brother? VEC9 is a brand new vector arcade video game heavily inspired by the 80’s (vector arcade games and the cold war) and developed as a one off by a team calling themselves "68 Crew". This new game is housed in a, very solid looking 80’s military style, full upright cabinet. An Asteroids vector monitor is used as the primary display (there’s an additional smaller raster monitor giving mission updates). A steering yoke control from an old tank and many glowing buttons allow the player to fly a spaceship into a 3D vector scape to shoot at various targets. The VEC9.com website makes a very good illusion that the VEC9 is Soviet technology dating from 1984. In reality of course, VEC9 is using today's technology (Xilinx Spartan-3E FPGA) to make for some very impressive 3D vector graphics. VEC9 has been doing the rounds the last few weeks appearing at various events. The most recent event was at Maker Faire, San Mateo, California. Click here to see more about VEC9 at the Maker Faire. Well, here it is in black and white, what to do with your favorite black and white console on November 1: play it! 2. Keep track of what they played. GeoAnas just sent me an email saying that he has published an interview with Martijn Wenting (Revival Studios) at www.iamretro.gr. As many Vectrex fans will know, Martijn is a prolific game and demo homebrewer for most retro computers and games consoles. In the past he has made some very nice games for the Vectrex. Read the interview here - It gives some hope about the eventual release of VexOS which includes running programs made in VexOSBasic! New Vectrex homebrewer going by the tag of mountaingoat has just released a game binary for the Vectrex called Marine Fox. This is a new game inspired by the old arcade classic Solar Fox. However, in Marine Fox you are piloting a submarine rather than a starship and your mission is to gather up sea crystals whilst avoiding the prowling sharks. Gather the crystals within the time limit and you earn bonus points. This is a good little game, as good as many of the original GCE releases and just 6K in size. It is definitely worth downloading. You can download the game from github. Fancy writing a demoscene type program and entering it into Russia’s oldest and biggest demoscene party? The CHAOS Constructions 2015 event features different competitions for the ZX Spectrum and other platforms (including Vectrex). They are also open to remote entries, and winners will get certificates. Or better still, make it a holiday, and attend the actual event which will be held on August 29th-30th 2015 in St Petersburg. This event promises to combine a demoscence competition party, retro computer exhibition, seminar and live acts. The organisers say the event will be "two days of a true nonstop demo party which will blow your mind!" More information can be found at www.chaosconstructions.ru. My reproduction Mine Storm Overlays have sold out. In the next couple of months I will be arranging anther batch of the YASI overlays. Making screen printed overlays is a learning process, but taking all that has been learnt so far, the YASI overlays will be better than the previous run and like the last Mine Storm overlays will be supplied with a protective thin layer to reduce any occurence of scratches during shipping. 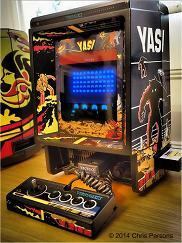 If you would like to be added to the YASI overlay interested list please email sales@vectrex.co.uk. When I have some news on these I will email the interested list first. Monday 25th May - Reproduction Mine Storm Overlays: the best yet! I’ve now shipped to all the "interested" persons who wanted Mine Storms overlays. I still have around 20 overlays remaining and these are now on public sale. These new screen printed overlays are even better than the previous batch I had made. Better colour registration than the originals, and guaranteed scratch free because they are now shipped with a protective layer - please see the video regarding removal of the protective layer. For the postage amount I can post up to two overlays in the same package. If you would like to purchase a reproduction Mine Storm overlay please email sales@vectrex.co.uk stating your country. Sunday 24th May - Colour Vectrex becomes reality? Australian Homebrewer calling himself Computer Nerd Kev has recently carried out experimentation for an LCD based electronic overlay for the Vectrex. He pulled out an LCD from an old digital photo viewer and adapted it so it could be used as an electronic overlay for the Vectrex. He was able to load in colour GIFs or JPEG bit images into the photo viewer using a removable SD card. With the LCD on front of the Vectrex screen, the LCD overlay does the same job as a conventional coloured plastic overlay and can give the illusion of colour vector graphics. Kev, even goes on to say that if a communication method between the Vectrex and LCD control electronics could be implemented, that some amount of interactivity may be possible between the game and the display colour. Just imagine, real time colouring of game objects would be possible! Still in the experimental stage, Kev concludes on his website that that it all works quite well even though the panel he used was too small and if a more suitable type of LCD panel was used it could of let through more light. More information can be found on his website: www.computernerdke.heliohost.org. Sometimes, I manage to get my hands on some cool Vectrex goodies. 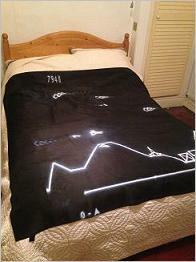 Just over a week ago I received what appears to be a large shower curtain, with Vectrex scramble graphics on. Checking out the score, its definitely not high enough for submission to the high scores page. Perhaps its been sent as a reminder to me to update the high scores page (soon gentlemen). The curtain is actually pretty neat and I have absolutely no idea who sent me this. The photo shows the curtain laid out on my bed to give an idea of the size. I've been a little preoccupied of late preparing and getting married. Is this a wedding present from somebody? Or a new product someone is hoping to sell? I am really curious to find out more and to thank the person who sent it. Wednesday 8th April 2015 - New Mine Storm reproduction overlays arrived! I’ve now finally received a batch of brand new Mine Storm overlays from my local printer. First comment, they are the best I’ve had made yet! The colour registration is superb and much better than the MB/GCE original. Please note these overlays are professionally screen printed and should not be confused with the lower quality homemade ink jet produced overlays. You wouldn’t be able to tell the difference from the original Mine Storm overlay. Other than the superior colour registration the only thing that is different is the small copyright text on the right side of the reproduction overlay. This text says reproduction on purpose in order to distinguish it from the original. The overlays are now shipped with a protective screen layer, so no scratches can occur on the surface. The image on the right shows the overlay prior to removal of the protective layer. First, I’m shipping these to those who previously expressed an interest. If you would like to be added to the "interested" list please send an email to sales@vectrex.co.uk and mention which country you are in. Tuesday 7th April 2015 - Doom on the Vectrex? Vectrex hacker Spritetm has certainly been showing of his skills recently, what with the YouTube video showing the Vectrex playing the Bad Apple video last month, and today a video of the Vectrex running the wire frame equivalent of the ubiquitous 90's Doom game. Called Voom, the video for the Vectrex Doom equivalent seems to show an interactive 3D perspective displayed and updated in in real time. The video is straight from the camera. There are no after-effects or other post processing. However, at this moment it is not known if this demo will actually turn into a game. Spritetm reports that the code and data currently take up 64K of flash, so maybe he has reached the Vectrex hardware and software limits, and the program will remain nothing more than a demo. Nevertheless, it's pretty amazing to see this running on the Vectrex. Hacker Jeroen Domburg aka Spritetm showed a YouTube video on the Vector Gaming Forums of the Japanese pop song "Bad Apple". This song originally gained fame from one of the scrolling shooter arcade games of the Touhou series by Japanese game maker ZUN. Why do I include this news here? Well, Jeroen has done something very clever. He has taken the original video and digitized, vectorized, compressed, linearized, resampled, rescaled and played it back on a Vectrex via his own designed multicart! The song audio is played via the Vectrex sound chip interleaved in the time between drawing the vectors. Jeroen has said that as soon as he has documented the project, the theory and build plans will be on his site at spritesmods.com. This gives me hope that one day a Playstation PS1 Vib-Ribbon inspired game could be written for the Vectrex! The Vectrex is often courted by artists for its vector graphics. The result is that the Vectrex is sometimes seen in art displays or its graphic output included in short videos. A few months ago Joeseph Hyde showed some videos where he had hooked into the XY and brightness signals of the Vectrex vector display and was feeding in various signals directly from his analogue synthesiser to modulate the electron beam in the Vectrex display. The results were amazing mesmerising vector patterns and symmetries. Fast forward 3 months, and UK based electronic band "	Vessels" (which had previously been tipped by Radio 1 as one of the hottest new bands in the UK) have released their third album titled "Dilate". The songs from the album on YouTube are all accompanied by video footage that is generated by the same technique developed by Joeseph. 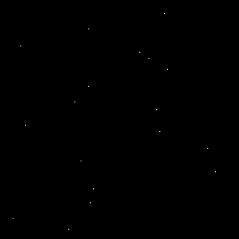 The vector patterns generated on the Vectrex display are a good match for the minimalistic techno style of their new album. George aka GeoAnas, Greek fan of the Vectrex and retro arcade game collector, contacted me yesterday to say that he had uploaded an interview he'd made with hombrewer Kristof Tuts. Kristof known in the Vectrex world for his fantastic Vectrexians and Vector Pilot home brew games provides an in depth overview of his game development and how he got into programming the Vectrex in the first place. Its an interesting story and there’s something in there for everyone, from info concerning the next games to be released to hints for budding Vectrex programmers. A highly recommended read for Vectrex fans! The interview can be viewed at www.iamretro.gr. Typically, George of Fury Unlimited usually makes one of his discontinued games available free for download every year. His Hexed game has just gone through this process. With a theme of spookiness, this is a card game for the Vectrex that was only available for two months on cartridge in 2013 (only 50 physical copies were created). I would class this as a mini game but still worth a look even if you’re not into card games. The game binary file can be downloaded from Fury’s website. Tuesday 13th January - Happy New Year! Belated New Year wishes. 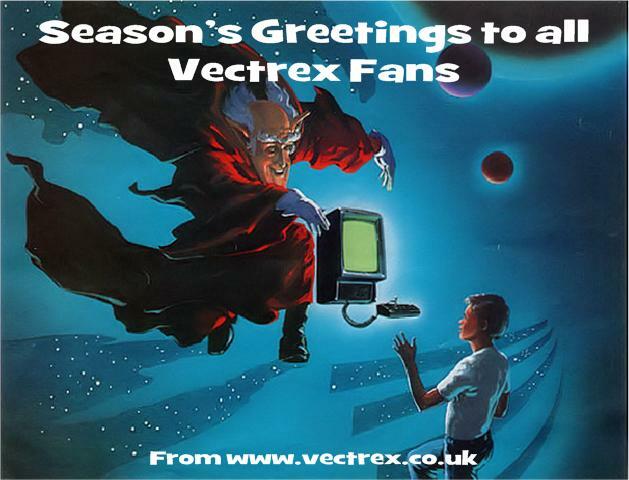 Last year was an exciting year for Vectrex fans. There was a flurry of new home brewers and developers offering goodies for the Vectrex throughout 2014. There was also a welcome return to the Vectrex community of some of the homebrewers who had been active a few years ago. As I said last year, there is a Vectrex renaissance! This year looks to be an even better one with respect to new games. Binarystar Software has promised the release of various Arcade games, Der Luchs is sure to release several more mini games. Plus there is seems a lot more home brewer activity chitchat on the web. Also could this be the year to see the release of Fury’s Warrior? (-I know, I said the same thing at the start of last year). My apologies to those who sent me high scores the last quarter of 2014. Work has got the better of me leaving very little time to update the website. I promise I will update the scores in the next few weeks. In addition there was a Vector War IV competition held last year, and I have received high scores from the organiser Helmut which will also be included in my high scores page. What of my activities? Last year I released the first edition of the VectrexMad! fanzine. That had over 400 downloads! I would like to make another one. If there would be contributions from any writers, that would be most appreciated and speed up the release of a 2nd edition. The YASI overlays I had made last year were a success - and I have sold all of them. I’m not going to do another run, but will be making another run of the Mine Storm overlays. If you want to be added to the "interested list" please send me an email.